At present I can supply form tools in HSS Molybdenum tool steel for cast iron or mild steel, or in Cobalt tool steel for stainless steel for Gauge 0 Scale 7, Gauge 0 Fine, Gauge One Scale 32,	Gauge One Fine, Gauge One Standard and for Gauge 3 Standard, 3 1/2″ and for 7 1/4″ gauge. Tools for Gauge 0, Gauge One 1 and for Gauge 3 are 3/8 x 3/8 x 4″. £45.00 each plus delivery. Add £15.00 for double ended tools. 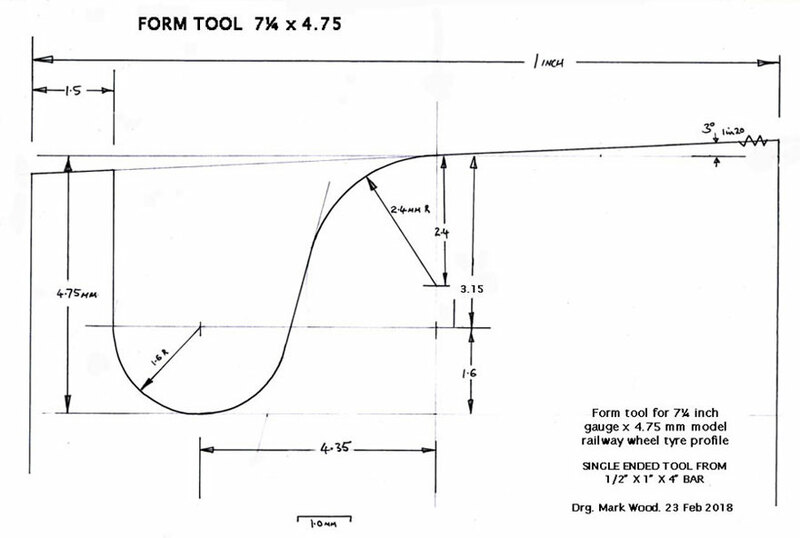 Tools for 3 1/2″ gauge are 1/2 x 1/2 x 4″. £50.00 each plus delivery. 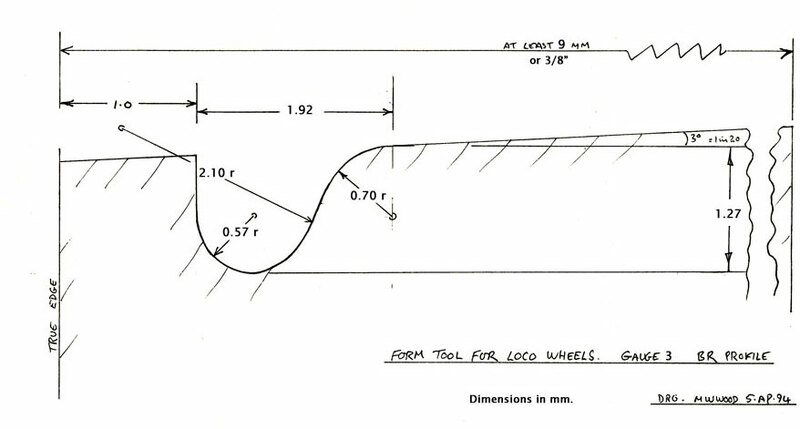 Tools for 7 1/4″ gauge are 1/2 x 1 x 4″. £60.00 each plus delivery. 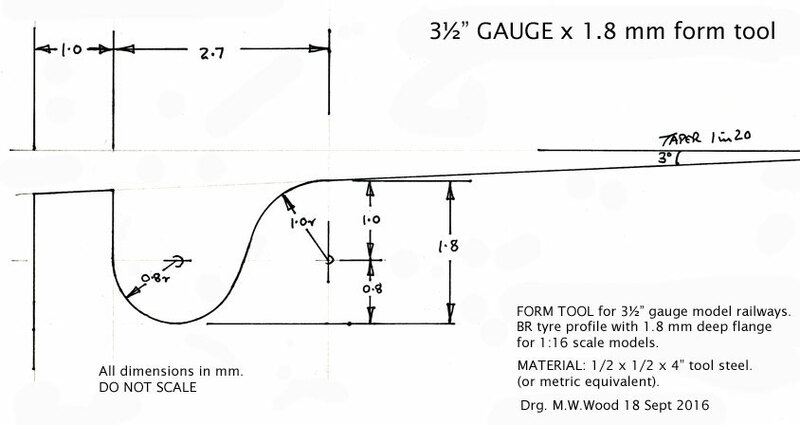 The G 1 Fine tool can also be used on G 1 Standard width tyres where a 1.5 mm deep flange is preferred. The tools have the same profile all down the end of the tool and can be sharpened by grinding a small amount off the top face. Mine usually profile about 80 to 100 wheels between sharpenings. These tools are recommended for lathes capable of low speeds, at least as slow as 100 rpm. Find the right speed for you by trial and error - too fast and the tool will not make an even cut. To prevent any vibration in work, make a small central 'pip' in the outer end of your mandrel to take a small amount of pressure from a live steady held in the tail stock. 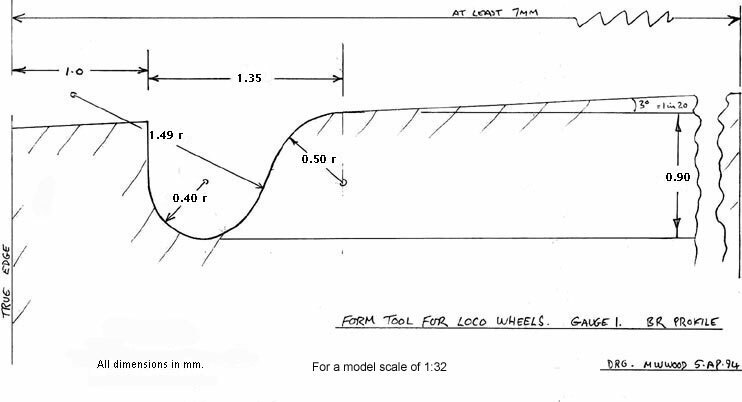 4 mm/ft, for EM gauge, use a Scale 7 formtool. 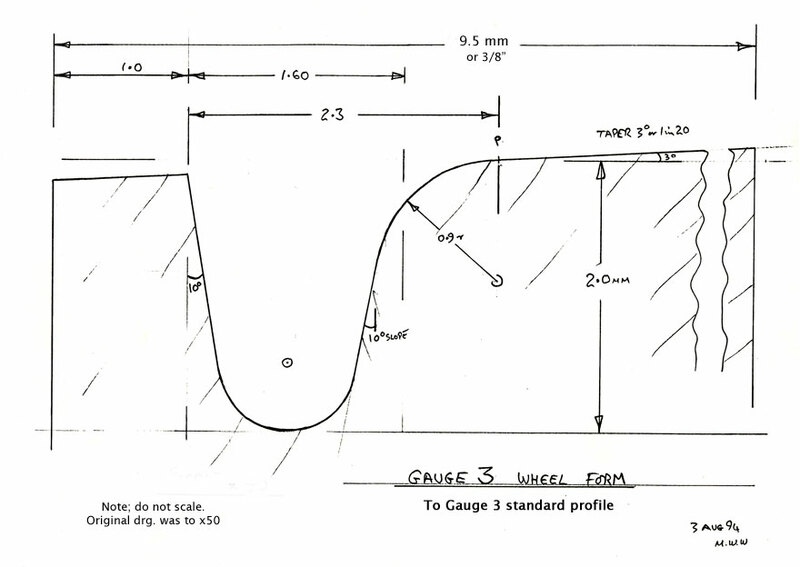 Gauge '0' Fine, HSS, 4. Gauge One Fine, HSS, 5. Gauge One Fine, Cobalt, 1. Gauge One Standard, HSS, 1. Gauge One Standard, Cobalt, 1. 3½″ gauge x 1.8 mm, HSS, 2. 3½″ gauge x 2.4 mm, HSS, 1. There are no double ended tools in stock, they can be made the next time I order a total of 10 tools. 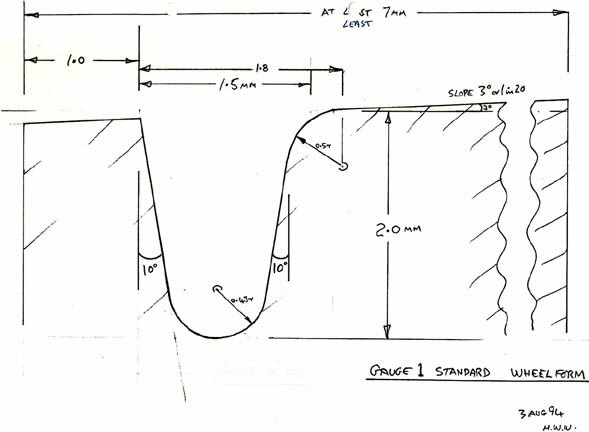 The fine standard tool is to the earlier standard, retaining a taper on the back of the flange to avoid the chances of accidentally cutting a step should the casting be postioned slightly more tightly on the mandrel than its predecessor. 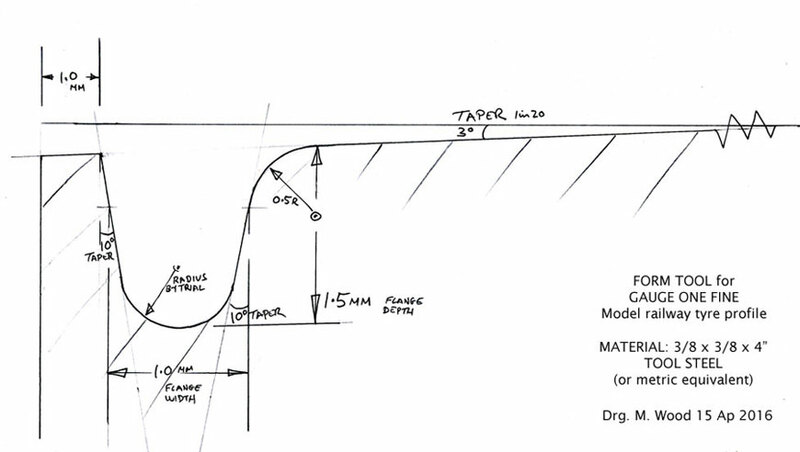 The standard standard tool is to the earlier standard, retaining a taper on the back of the flange to avoid the chances of accidentally cutting a step should the casting be postioned slightly more tightly on the mandrel than its predecessor.